THE PARK PLACE CONDOMINIUM BUILDING. 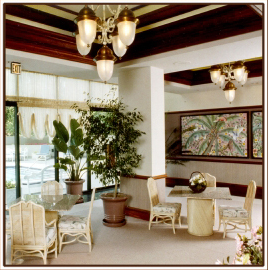 This residential building in Atlanta is one of the most prestigious addresses in the South. The style Is antI-bellum as might befit a plantation before the war between the states. 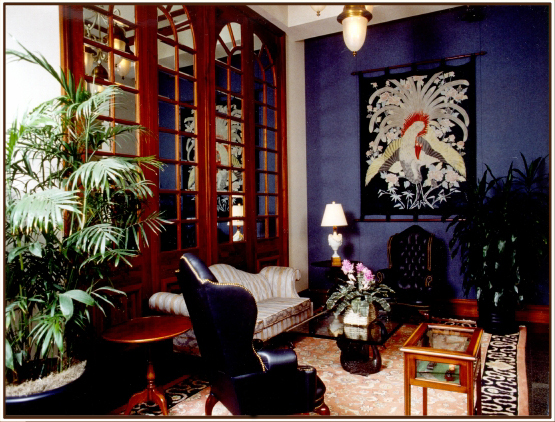 The lobby lounge area features an antique "tsu-tsu-gaki" Japanese bedcover created in a dye-resist technique similar to batique. Oriental accents would have decorated homes of this period because of the "China trade" which brought an exchange of the culture of East and West. THE WINE ROOM, ATLANTA. This unique setting was created for the clients buying a residence in Park Place condominium building. Each residence came with part ownership of this wine room including a wine cabinet locker sufficient for a dozen bottles of fine wine. This room was provided not only for storage of the owners wine but for entertainment of their guests. The floor is Georgia flag stone. The ceiling is painted in "trompe loeil" effect of grape arbors and beautiful Italian skies. 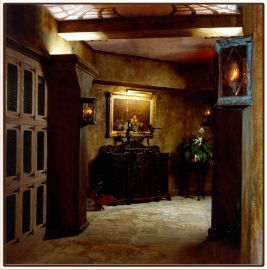 The walls and columns are painted in "faux" finishes to enhance the feeling of an aged cellar. The wall lanterns flicker with "candle" light. 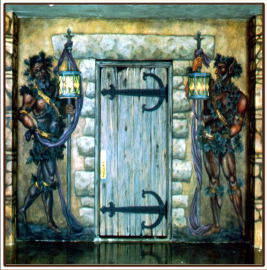 The entry door is painted in a theatrical reference to Baccus with two acolytes defining the entrance.